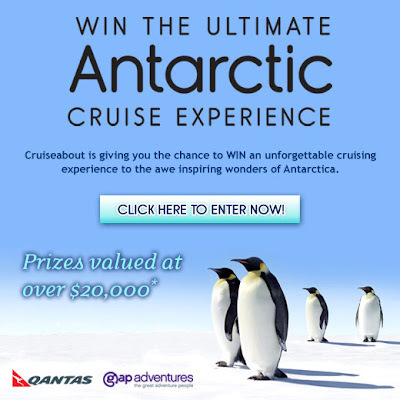 Cruiseabout is giving you the chance to WIN an unforgettable cruising experience to the awe inspiring wonders of Antarctica. Spend 11 nights getting up close and personal with the fascinating marine life, bird species and most spectacular shifting landscapes on Earth. Encounter leopard seals and immense rookeries of a variety of penguins and witness dramatic glaciers and icebergs from the open deck, while the M/S Expedition brings you safely and comfortably through the marvels of the South Shetland Islands and the Antarctic Peninsula. Expert guides and lecturers offer knowledge insights to bring the natural history to life and create an adventure of a lifetime. This is an adventure experience you'll never forget as you explore the majesty and enormity of this amazing 7th continent. It truly is like no other place on Earth.